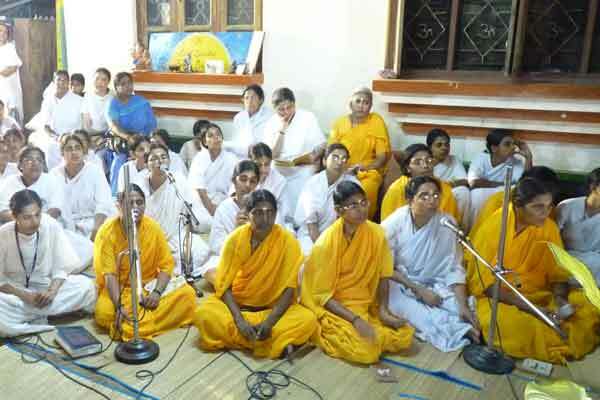 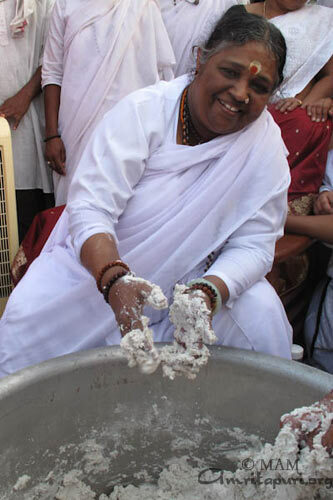 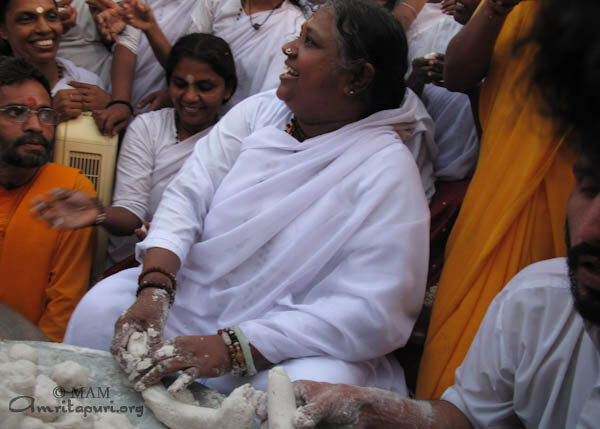 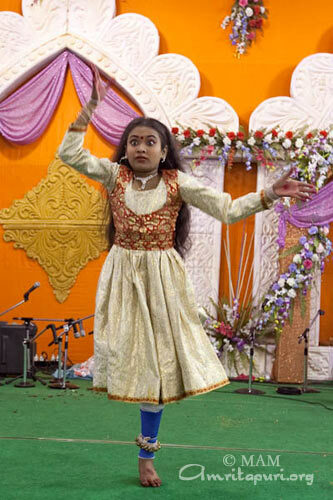 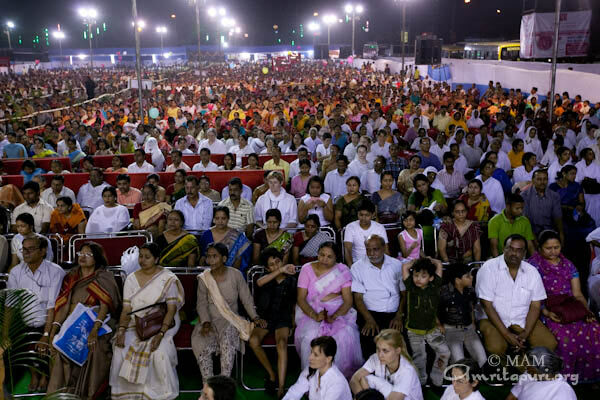 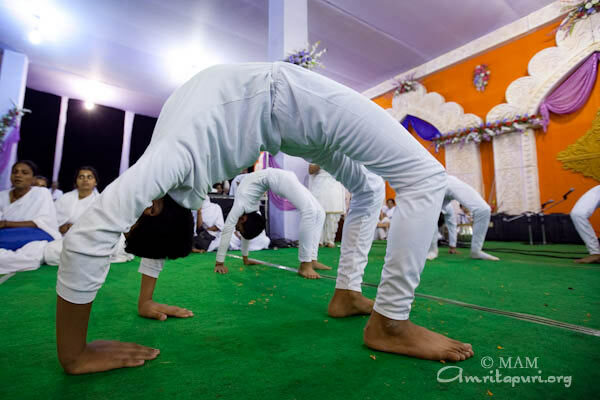 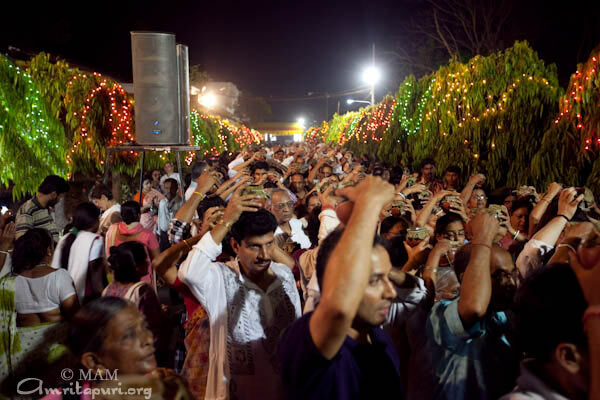 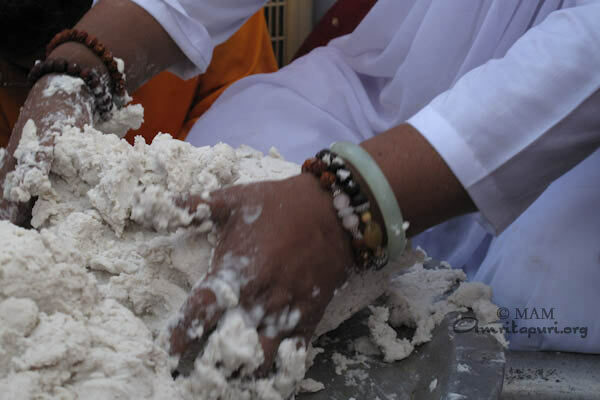 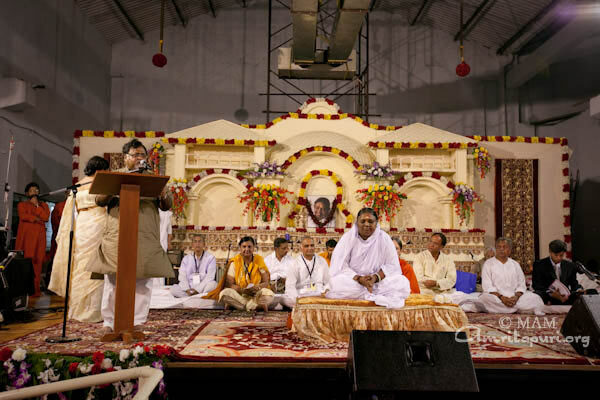 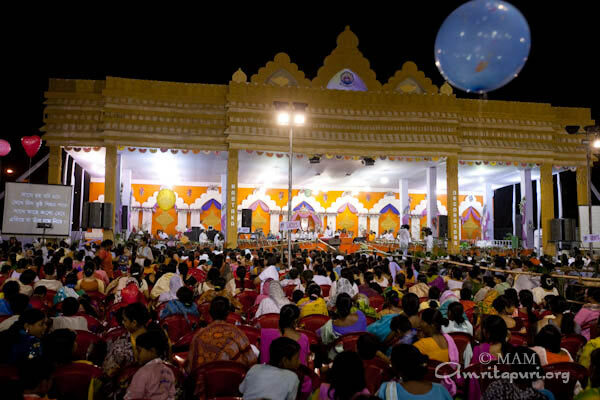 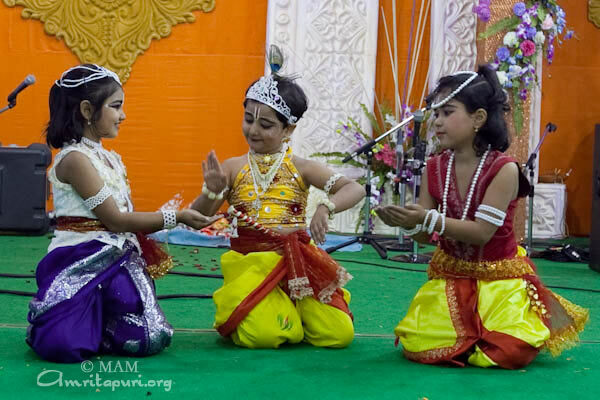 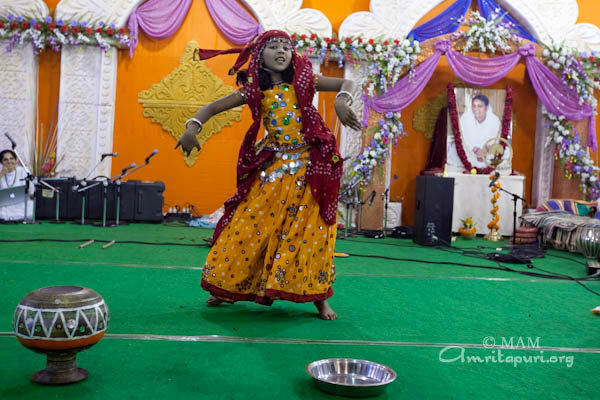 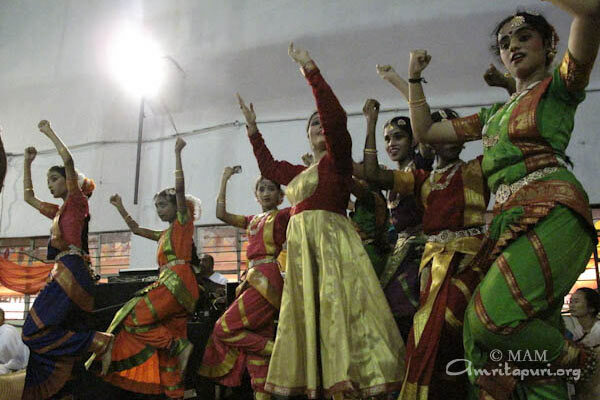 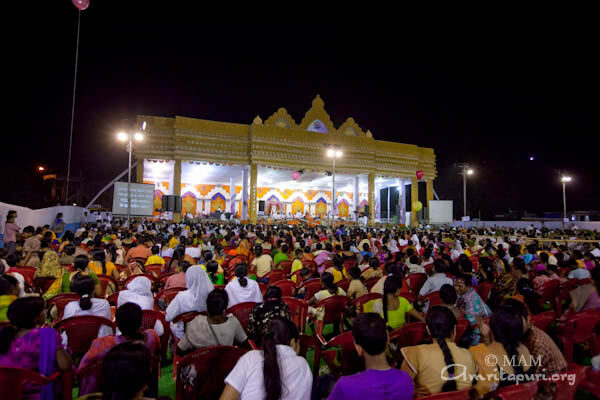 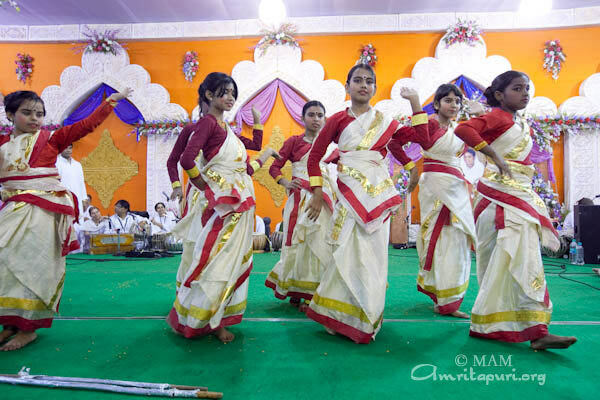 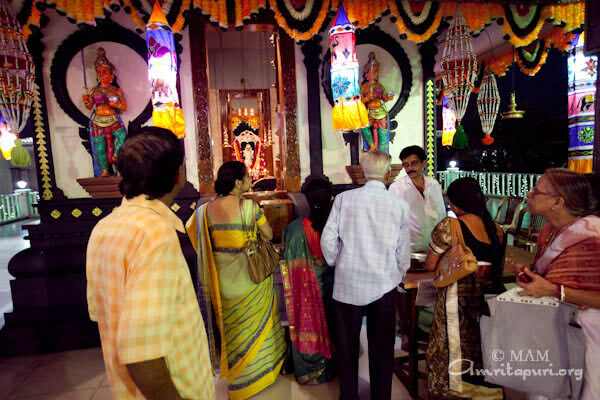 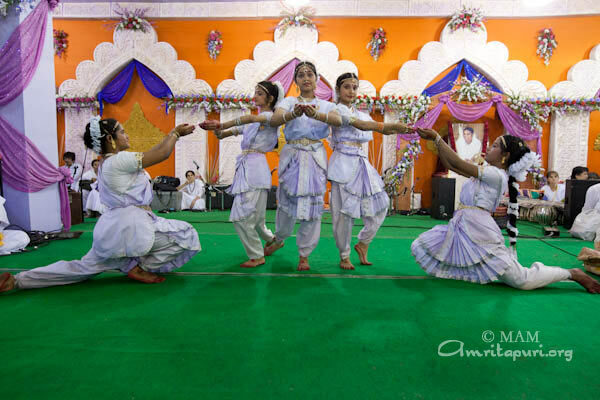 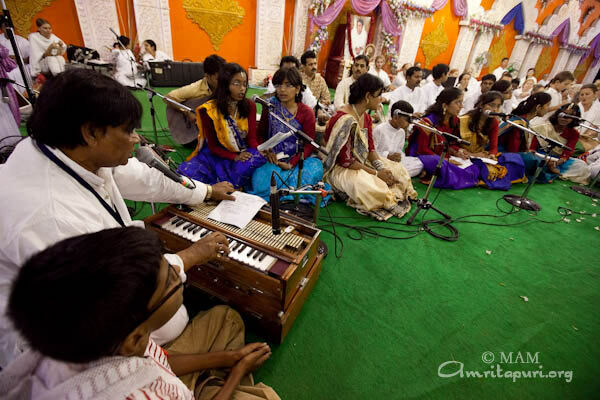 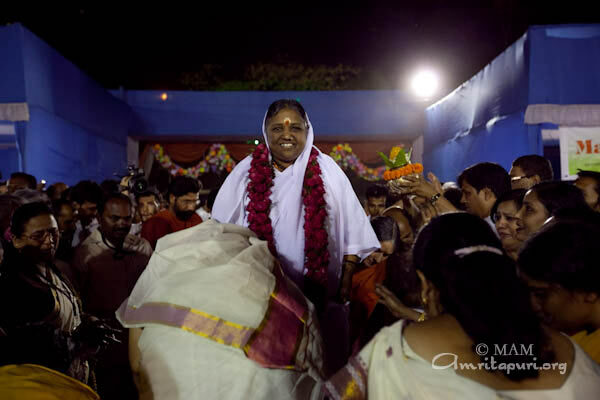 Amma’s Brahmasthanam festival was held in Kolkata on 20th and 21st March 2010. 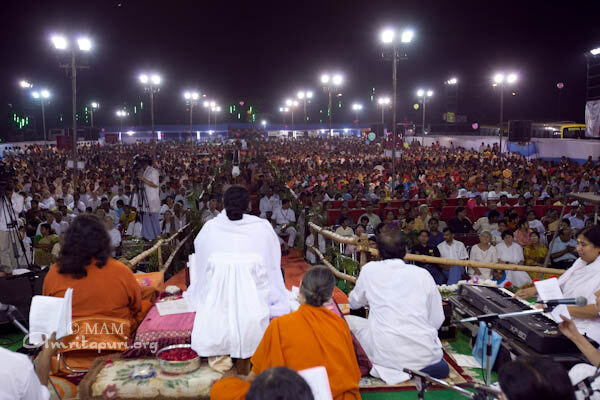 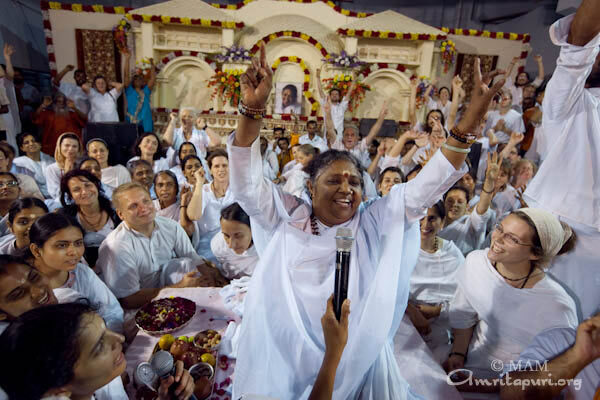 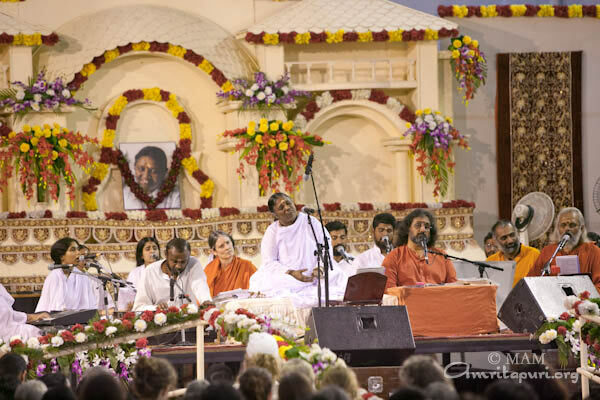 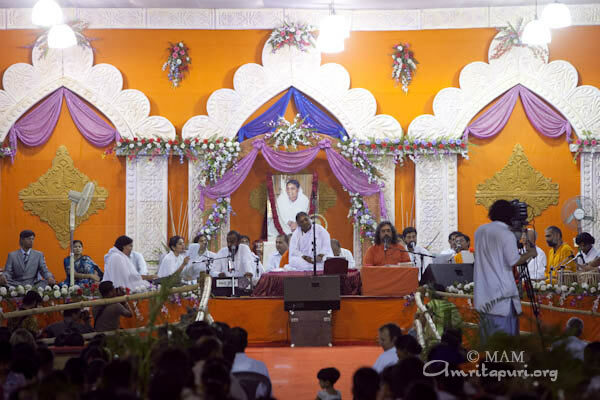 During these two days, Amma gave darshan, sang bhajans and gave satsang twice daily translated into the local language, Bengali. 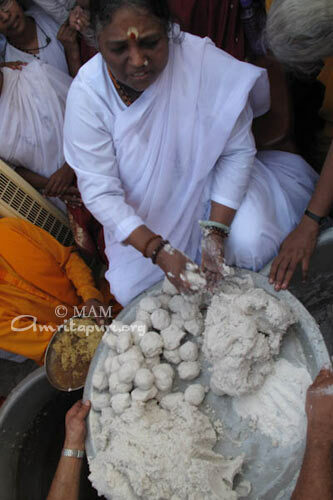 A highlight was Amma singing many Bengali bhajans and conducting herself, some steps of the Manasa puja, in Bengali too. 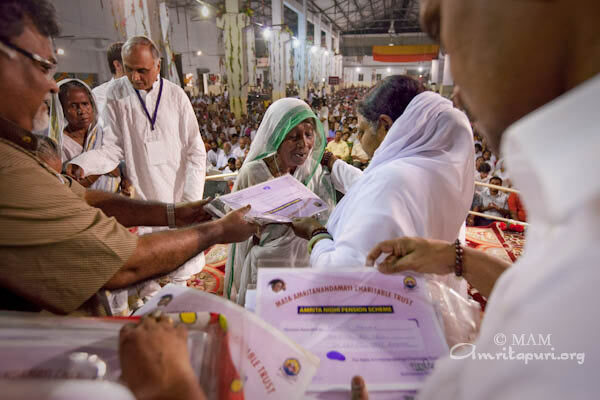 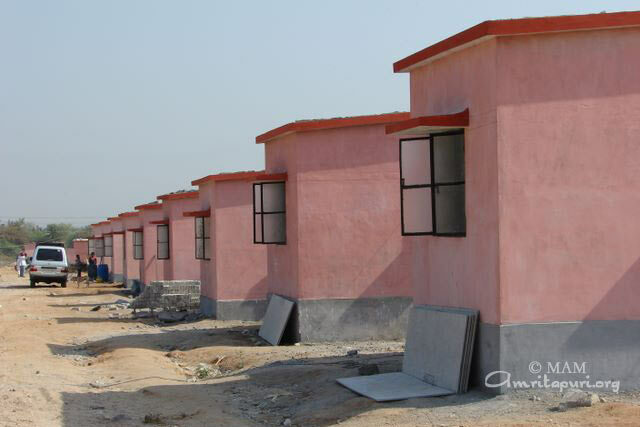 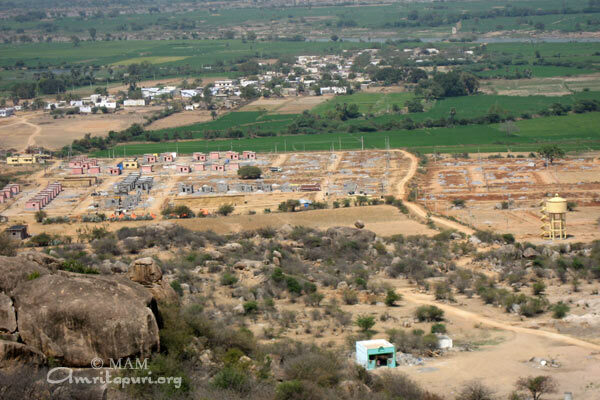 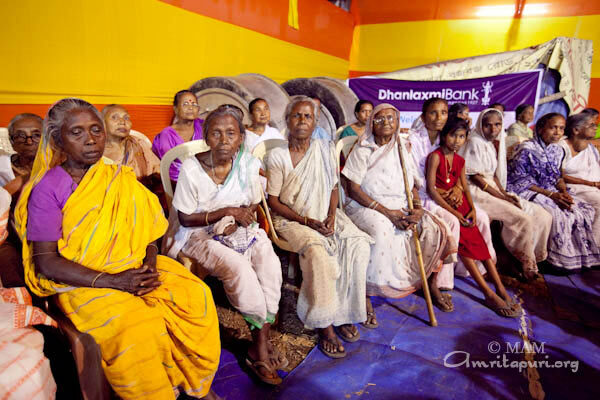 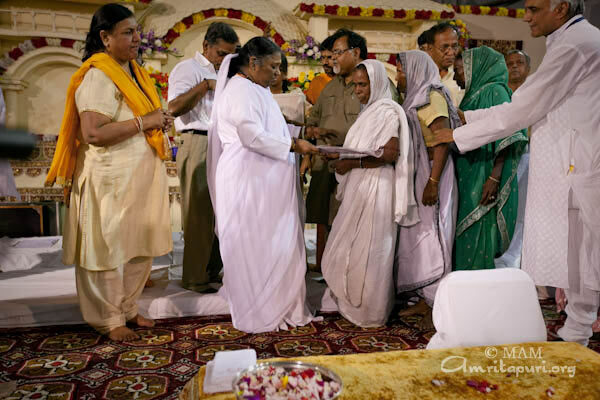 Functions were also held during the two days during which 50 free pensions were given to poor and impoverished people as part of the Amrta Nidhi pension program, and keys were handed over to the new owners of the 275 completed houses from the Amrita Kuteeram Project, Amma’s free housing project, who were victims of natural disasters. 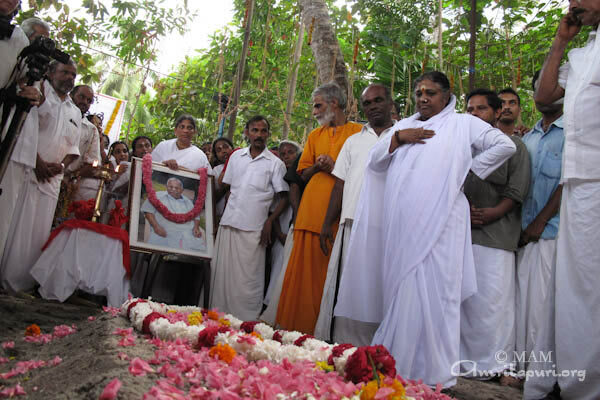 Documentary on Amma’s Father, Sugunacchan, produced and aired by Amrita TV as a tribute to his memory, after he passed away on 22nd March 2010. 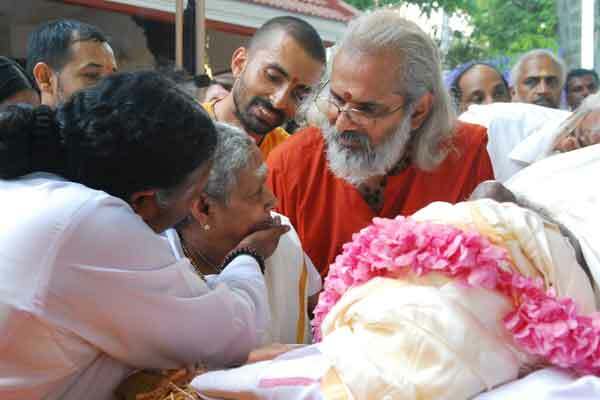 It is a 27 minute tribute which includes beautiful scenes of Acchan with Amma and his wife Damayanti; as well as testimonials from Swamis and his children. 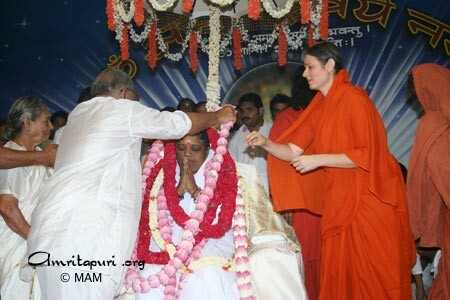 Amma was in Kolkata when her father, Sri. 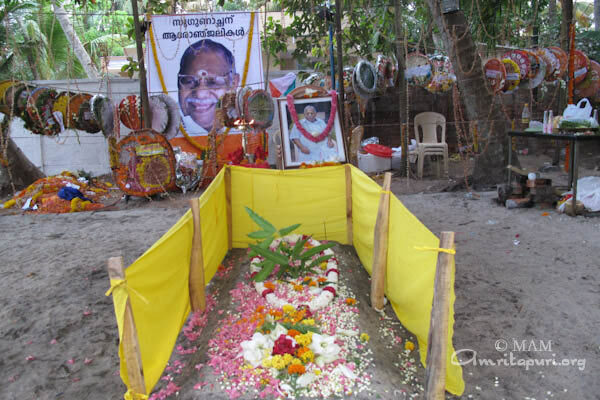 Sugunanandan Idamannel (Sugunacchan) passed away Monday morning (22 March 2010). 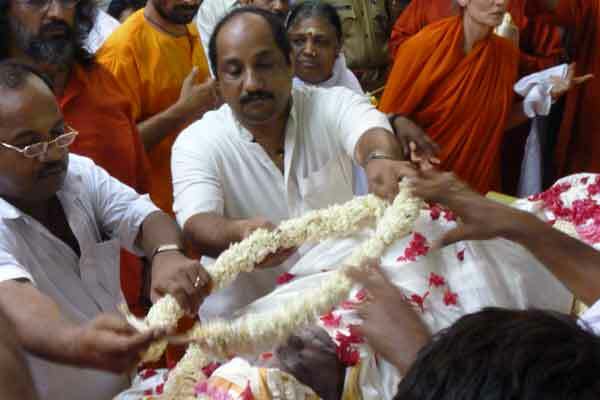 From that morning itself, his relatives and the ashramites who had not gone on tour with Amma began chanting archana and holding vigil around his body, which had been decorated with flower garlands and placed in a glass case at the hospital. 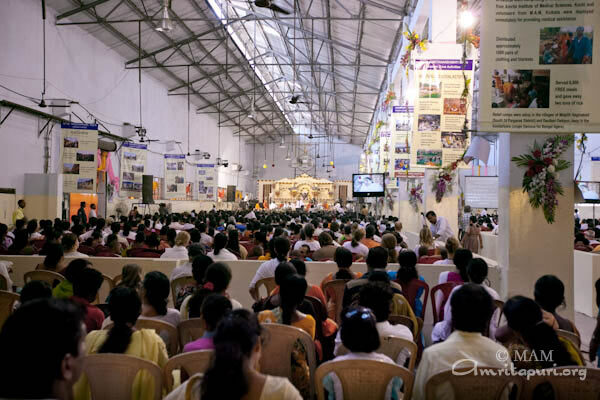 Word spread quickly, and his relatives, members of the community and, increasingly, Amma’s devotees, began coming to offer flowers and to pay their respects. 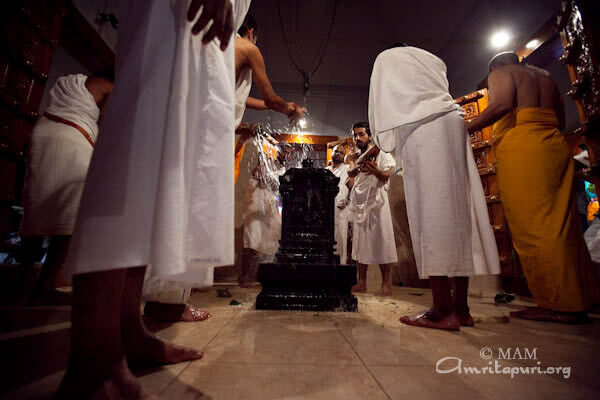 Each person circumambulated his body and prostrated at his feet before joining those seated in their prayers. 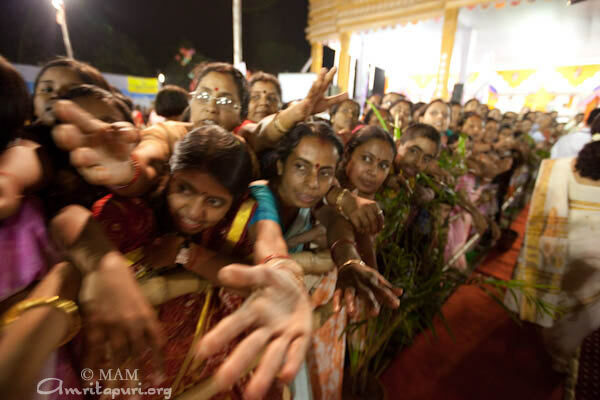 The crowd of well-wishers spilled out of the room, into the corridor, onto the hospital veranda and filled the grounds in front of the hospital. 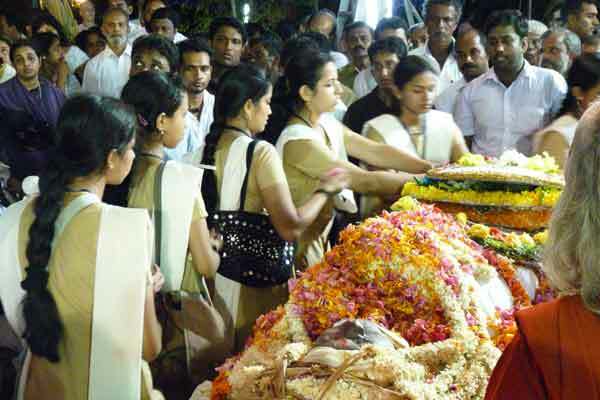 The next morning, Amma arrived and went to meet Sugunacchan’s other children and their families, where she also circumambulated Acchan’s body and consoled the distraught relatives. 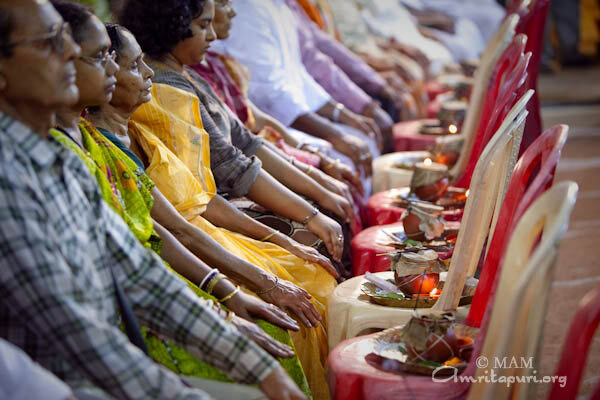 She sat in prayer while the ashramites continued chanting archana. 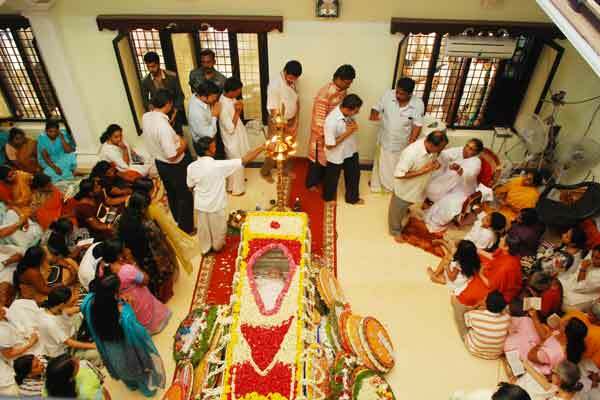 After some time, she walked in procession behind the body as it was carried to his home and placed in the center of the house’s main hall. 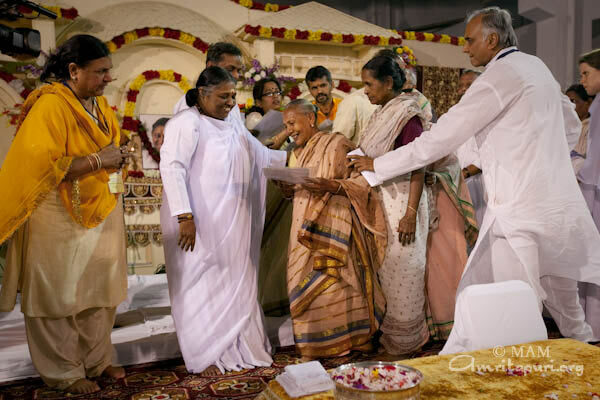 There, Amma asked the ashramites to begin chanting the eighth chapter of the Bhagavad Gita, which is traditionally chanted after death and prior to cremation. 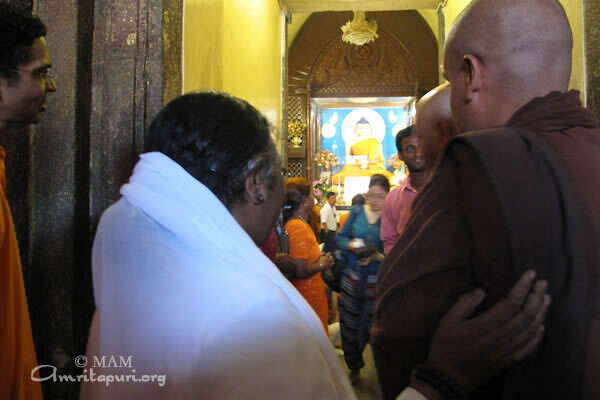 This chanting continued unbroken for the next 36 hours, as devotees and well-wishers flowed through the front doors of the house to circumambulate Sugunacchan’s body and pay their respects. 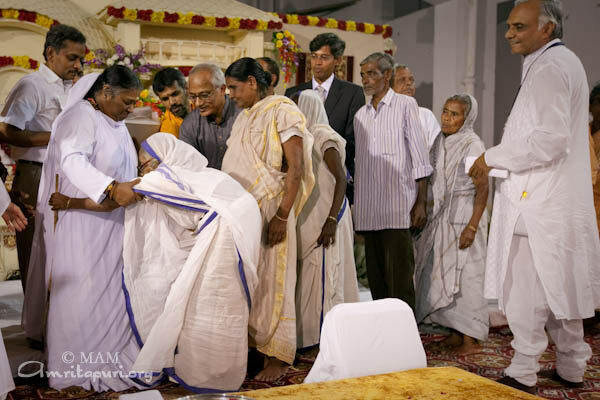 For much of the time, Amma also sat. 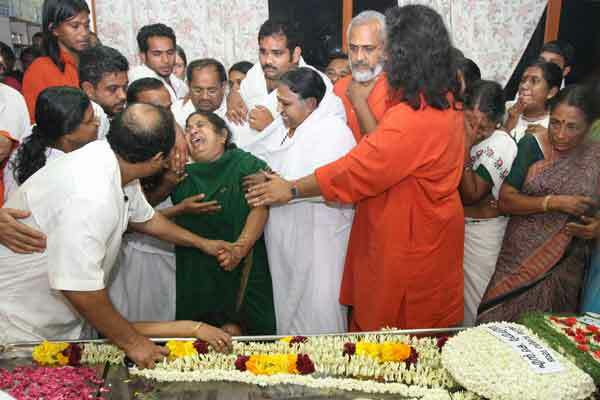 Many cried openly in Amma’s arms. 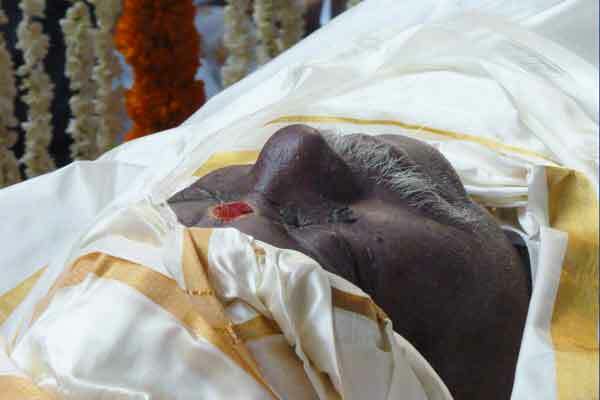 Even for those who did not know him personally, it felt a great loss. 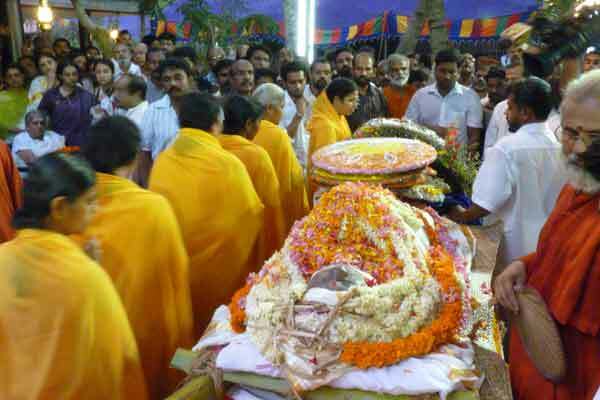 Many expressed that they felt they could never repay their debt of gratitude to the man who had helped bring into the world the form of Sudhamani Idamannel, the girl who would grow up to be seen as the mother of millions. 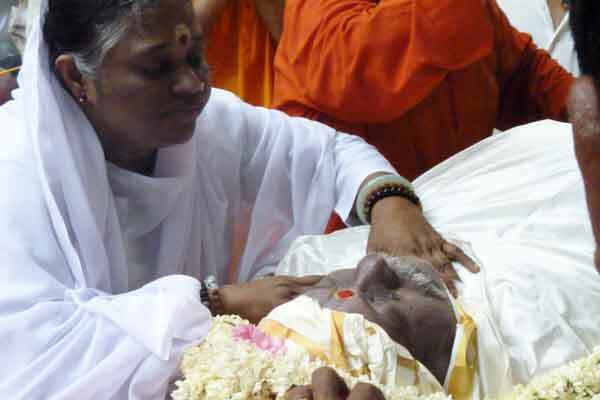 Amma herself was never distraught. 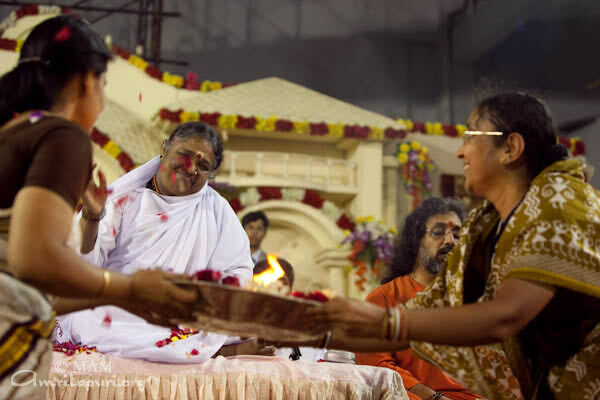 At the same time, she seemed equally at home fulfilling her dharma as the daughter of Sugunacchan, as she is serving as mother, guru, guide, and leader. 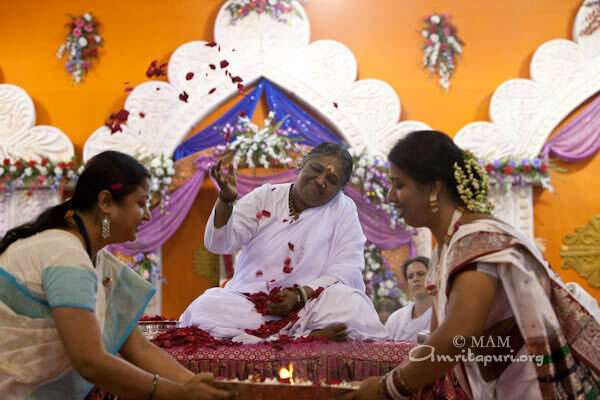 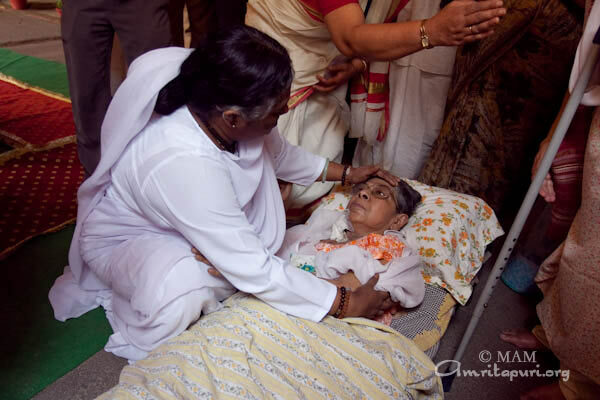 At 8:00 p.m., Amma stood and circumambulated his body, kissing and blessing him. 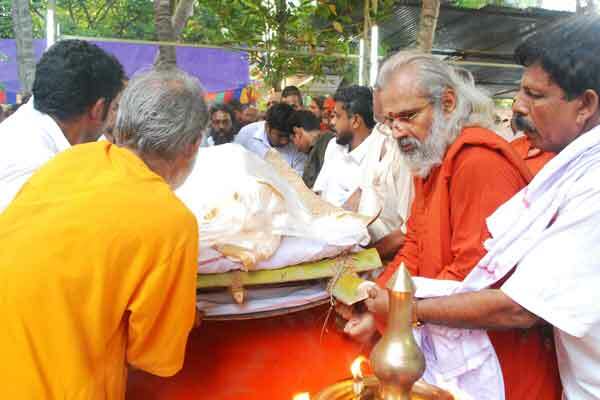 His body was carried by his sons and grandsons, as well as the senior sannyasis of the Math, to the cremation ground, led by his eldest surviving son, Sri. 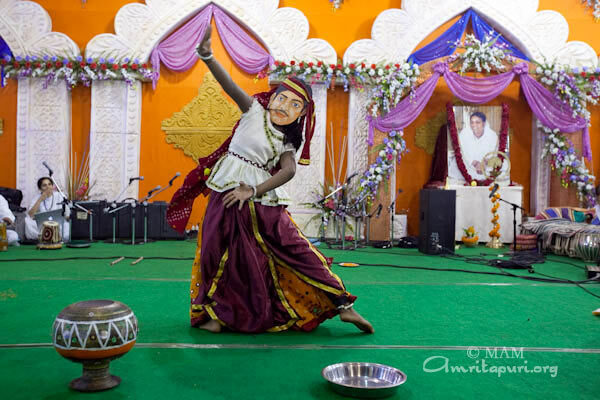 Suresh. 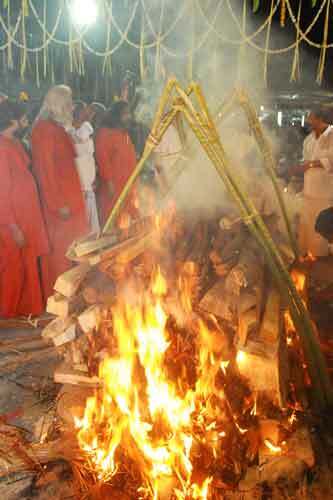 After performing all the customary rites, the flames of the funeral pyre were lit, and Sri. 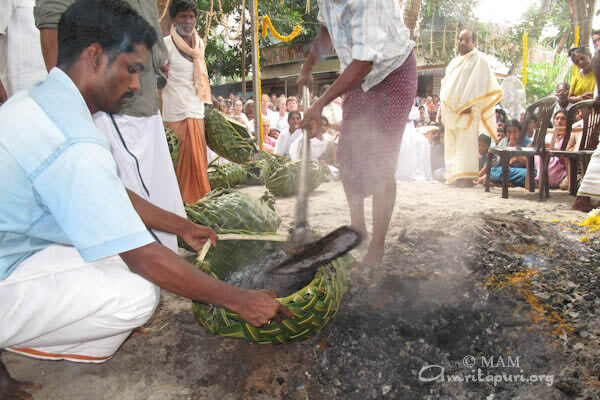 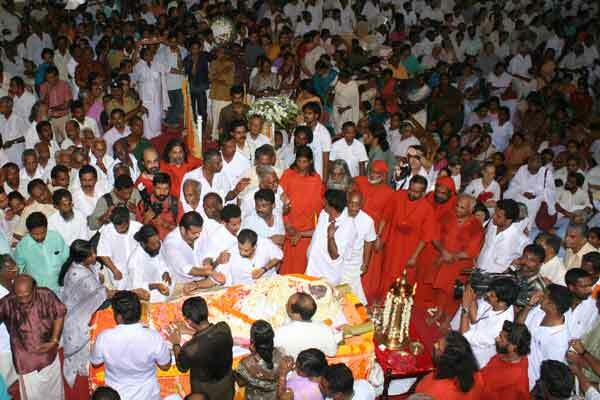 Sugunanandan Idamannel’s body was offered back to the elements. 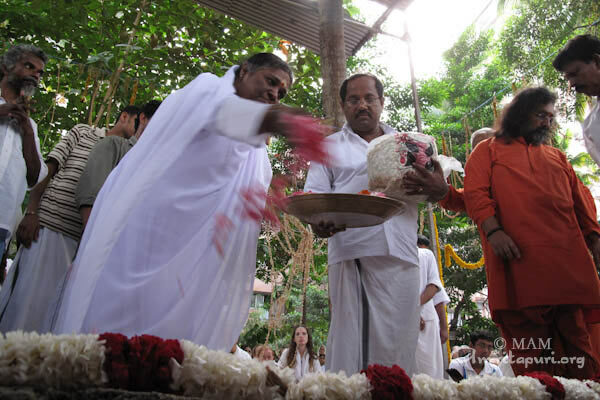 On the day following the cremation, the 25th March, a ceremonial function of collecting the ashes (sanjayana) was held in Amma’s presence, lead by Amma’s elder brother Suresh. 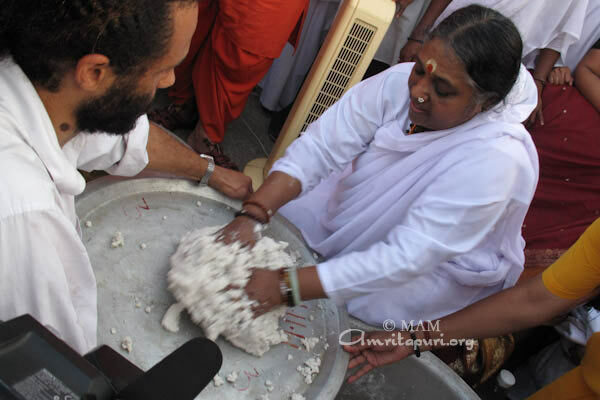 As per the tradition some of the ashes will be kept for spreading in spiritual locations accross India. 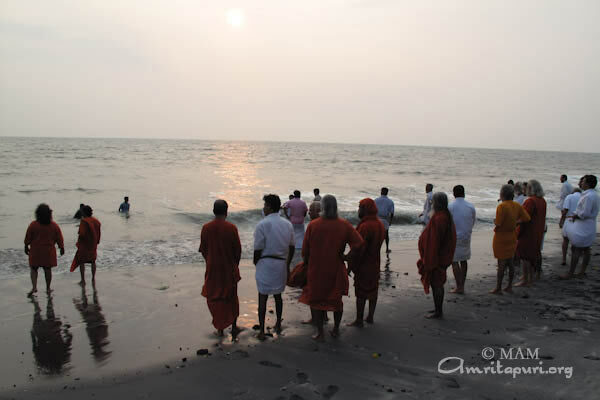 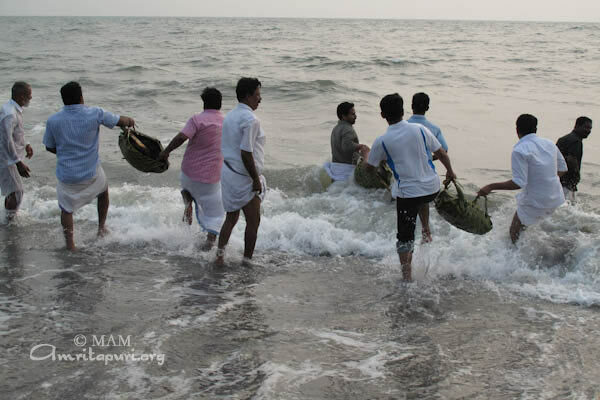 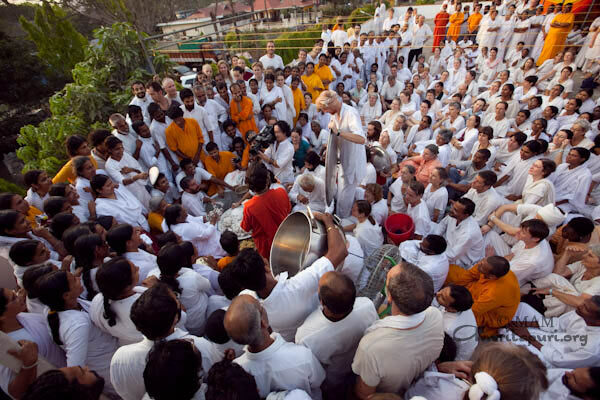 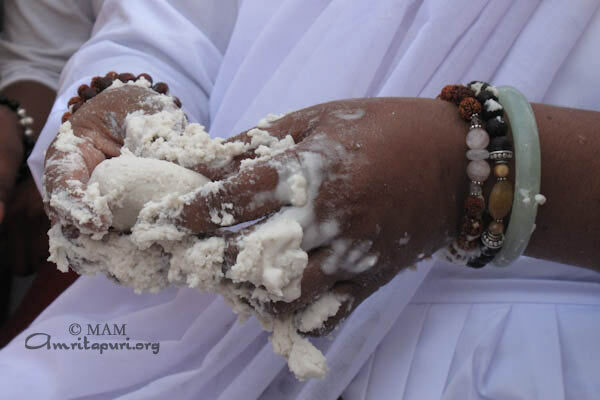 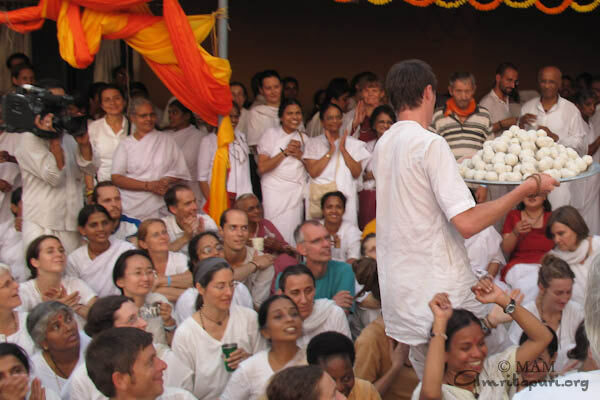 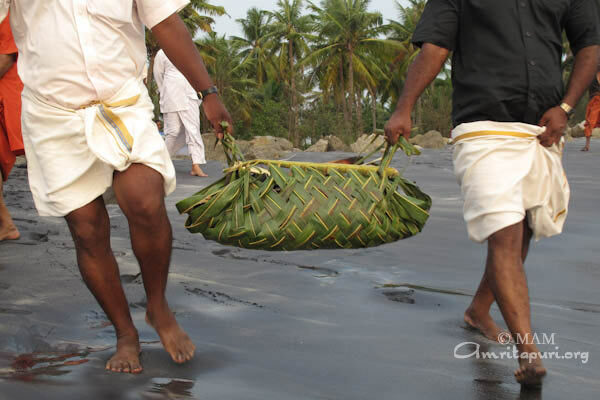 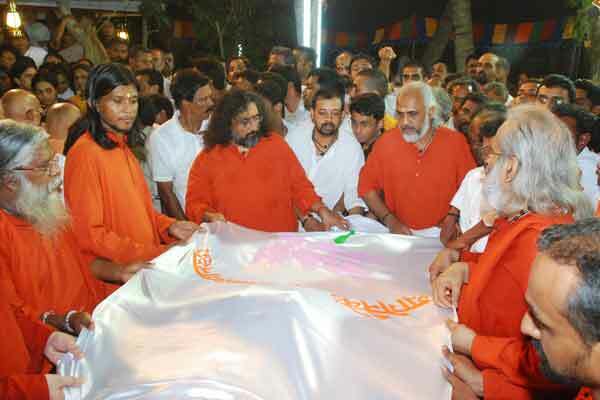 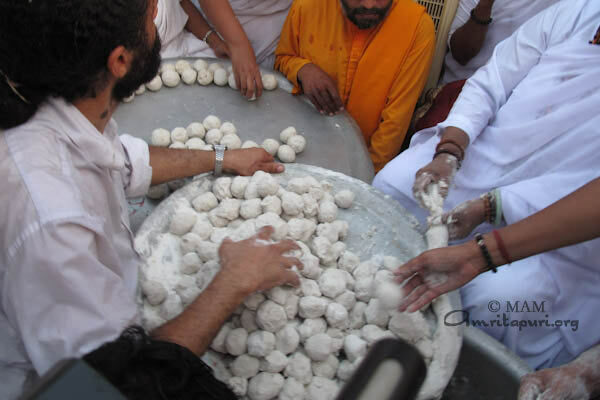 The remaining ashes were carried on that same day to the Amritapuri ocean by the family’s male members and the swamis. 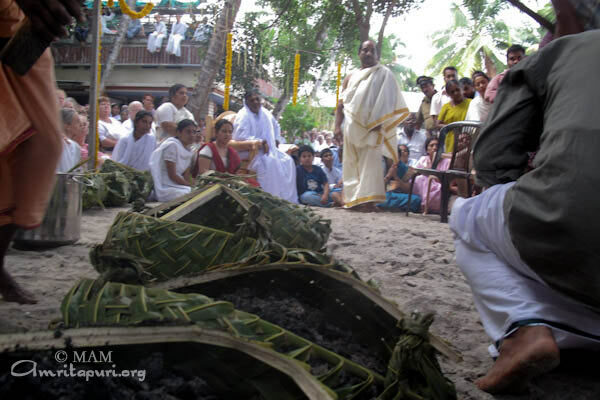 Traditional ceremonies and observations will take place successively during next 16 days, until 8th April. 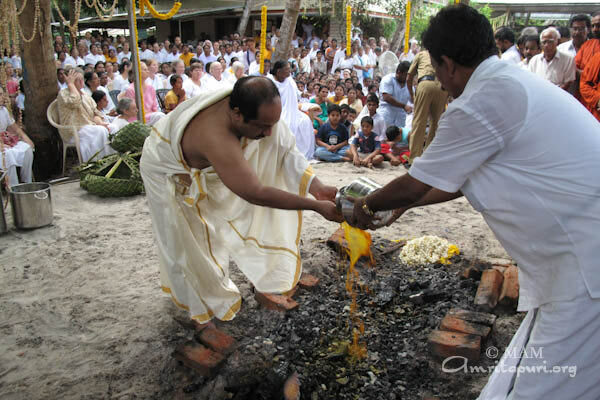 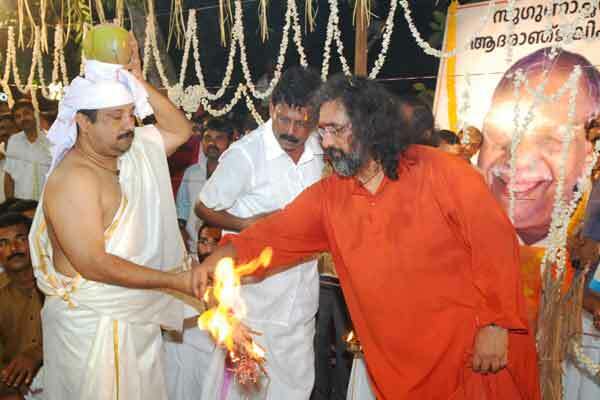 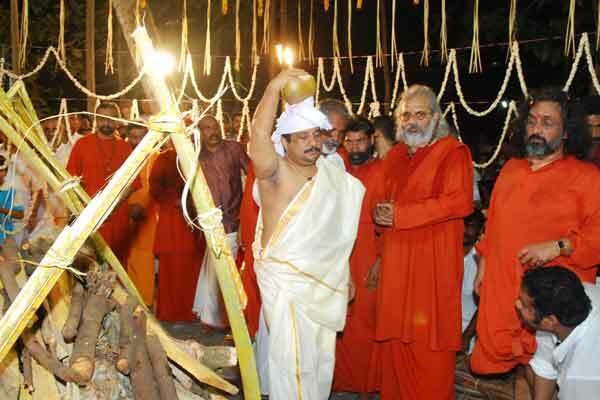 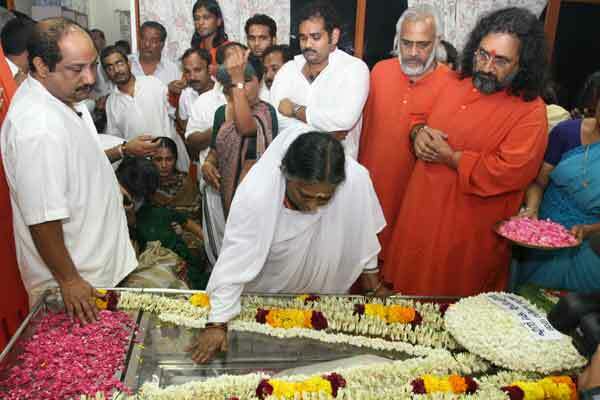 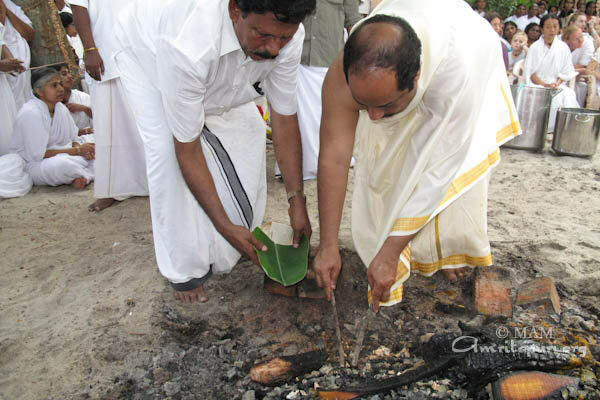 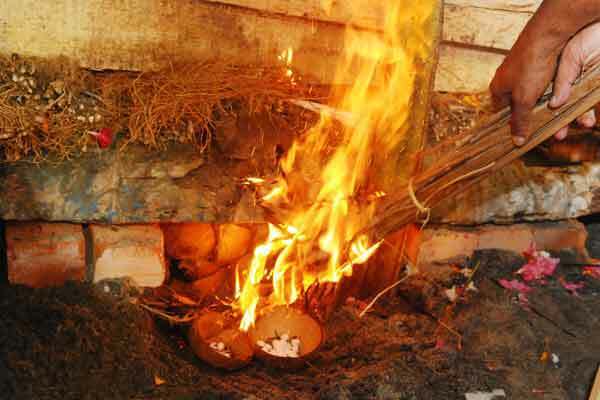 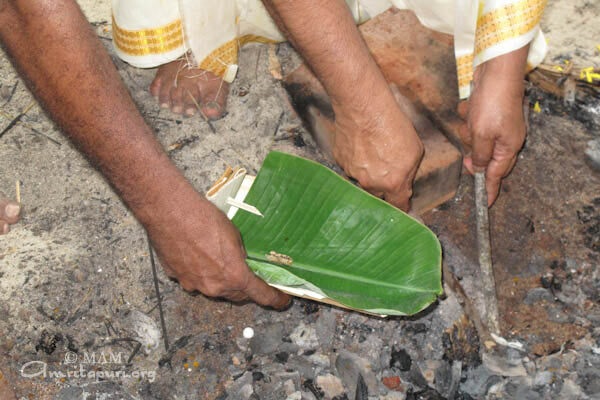 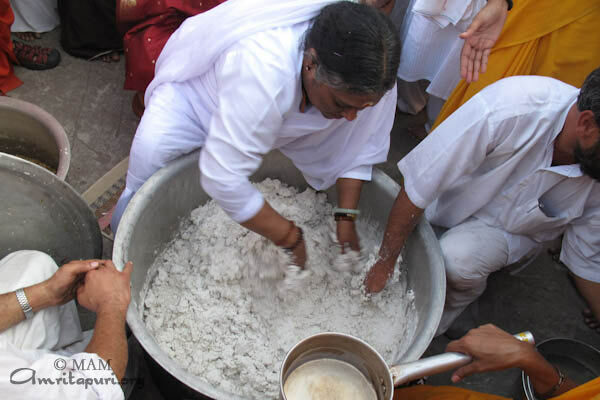 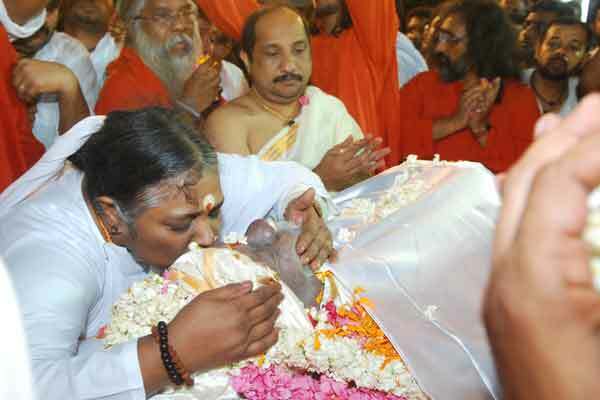 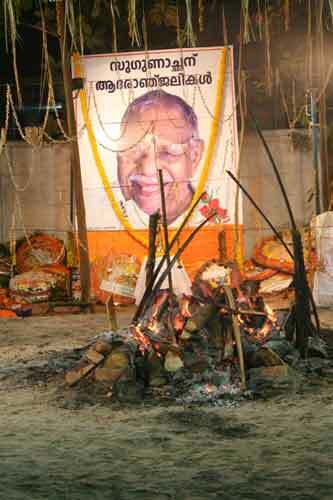 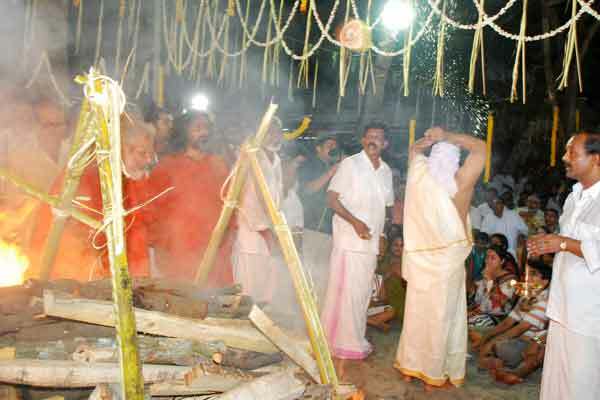 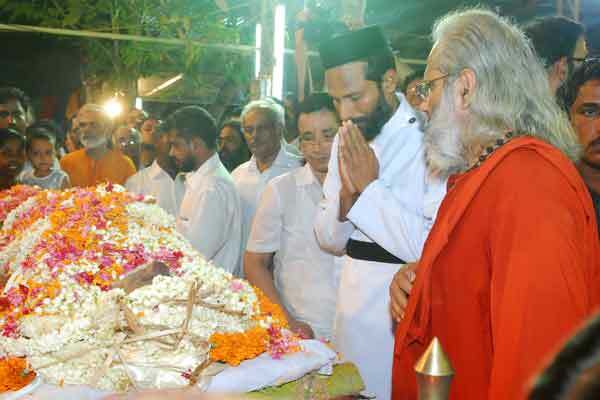 The body of Sugunanandan, father of Mata Amritanandamayi, who died on Monday (22 Mar 2010), was cremated on the premises of his Edamannel house near the Amritapuri ashram on Wednesday at 8 p.m. Suresh Kumar, the eldest son of Sugunanandan, lit the pyre. 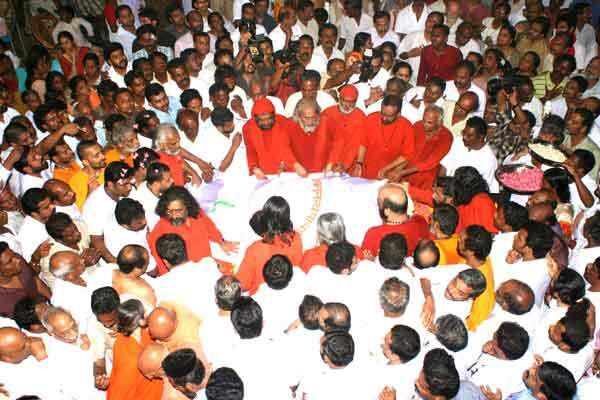 Thousands of people including devotees, Sanyasins of various ashrams, political and community leaders paid their last respects to the departed father of Amma. 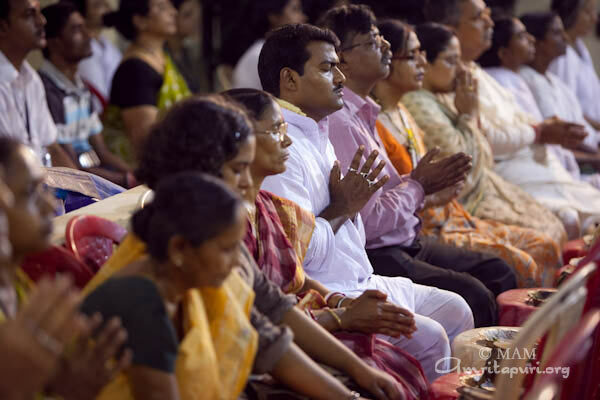 Amma, who returned from Kolkata on Tuesday morning, was sitting by the side of the body along with her mother Damayanthi, sisters and brothers and sanyasins. 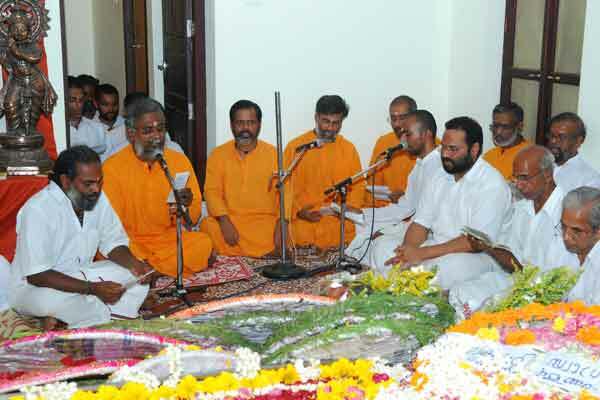 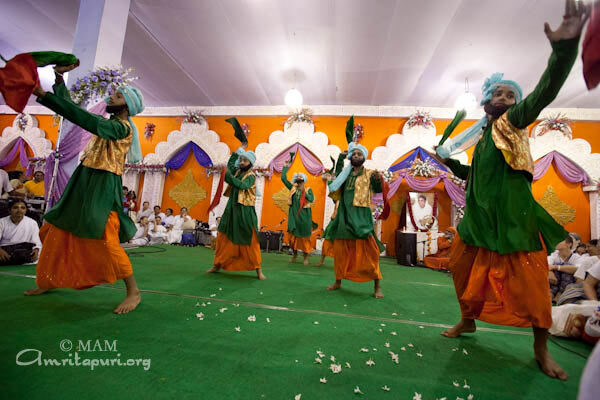 Ashramites have been chanting 8th Chapter of Bhagavad Gita repeatedly round the clock. 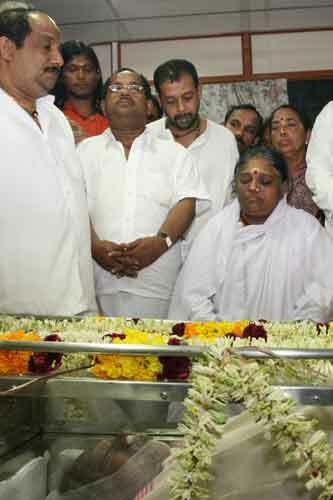 Ministers C Divakaran, N K Premachandran, Kadannappally Ramachandran, Opposition leader Oommen Chandy, Congress leaders V M Sudheeran and G Karthikeyan, Kerala Congress leader K M Mani and SNDP Yogam general secretary Vellappalli Natesan were among those who paid their last respects to Sugunanandan.Union ministers A K Antony and Vayalar Ravi, Chief Minister V S Achuthanandan, Ministers G Sudhakaran and S Sarma and CPM State secretary Pinarayi Vijayan were among those who sent condolence messages. 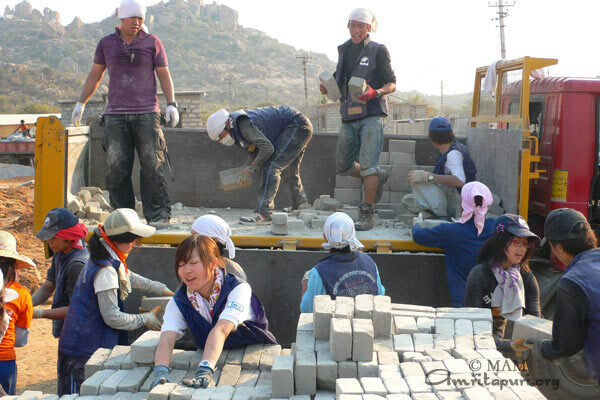 The National Committee of the UN-Decade “Education for Sustainable Development” awarded M.A. 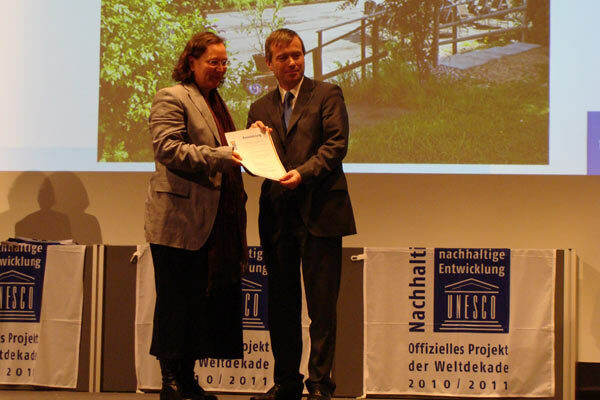 Center Germany as an official UNESCO Decade Project. 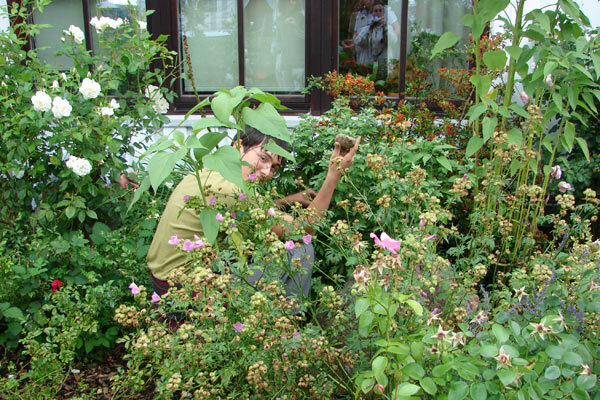 The award is given to institutions and communities that provide a positive example to the local community by operating according to the principles of sustainable living. 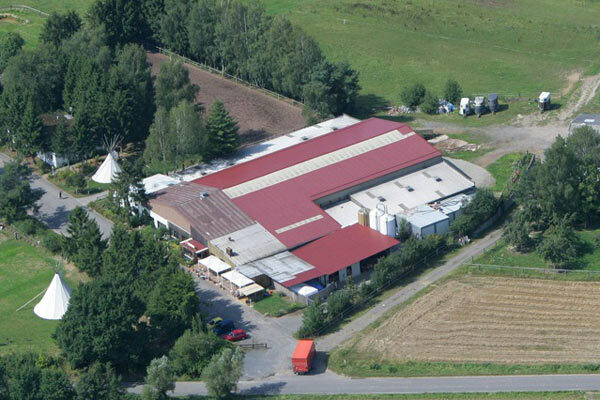 M.A.Center Germany received the award for its holistic approach to sustainability in all areas of life. 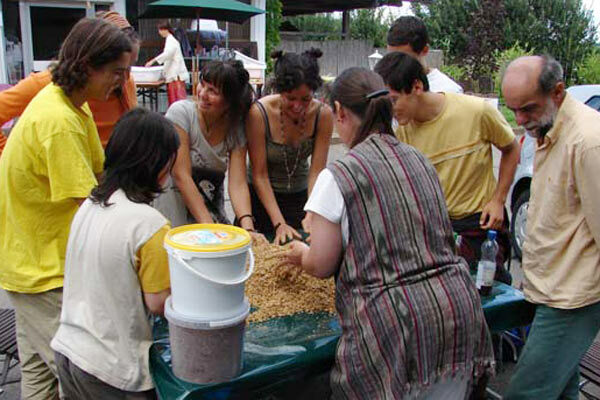 The centre uses primarily organic and regional foods, and further seeks self-sufficiency in the use of energy and water. 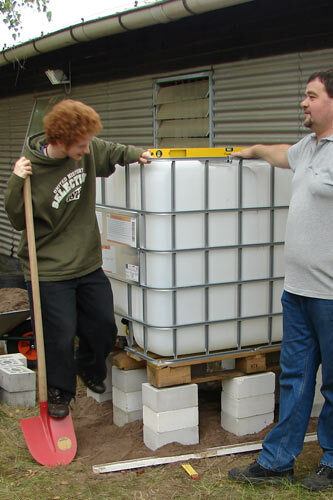 Cisterns are already in use and other eco-friendly technologies like photovoltaic, solar-heating and wood-chip-heating systems are scheduled. 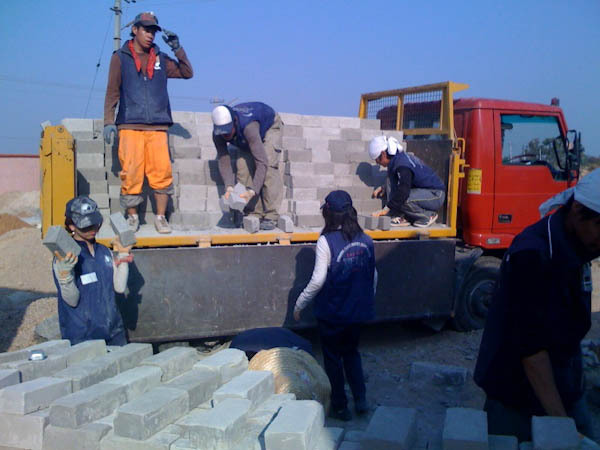 For the conversion and construction of buildings, ecological materials are used and the principles of a passive house are implemented, which means that due to advanced insulation no additional heating is required, even during the cold winters. 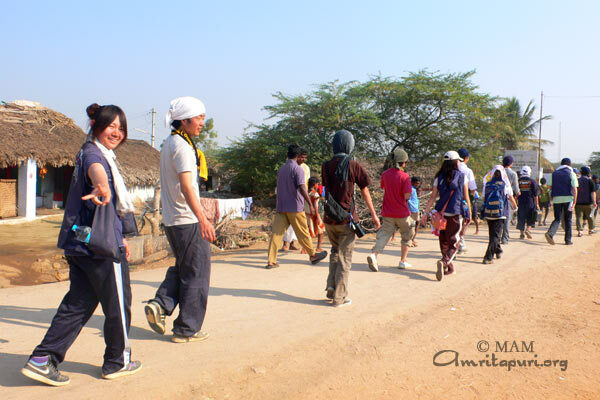 The centre offers retreats on conscious living, meditation, organic cultivation of vegetable and herbs as well as yoga and art workshops. 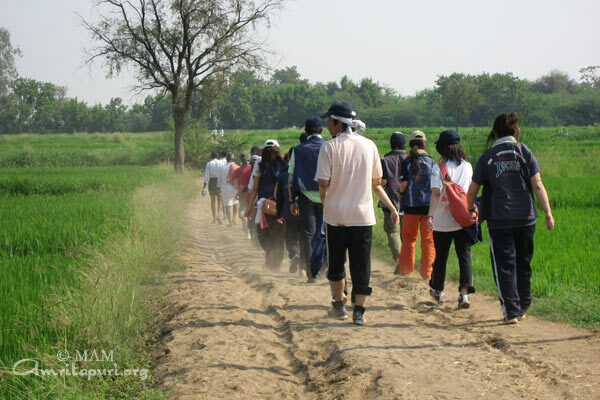 Since 2006, the centre has been organizing Youth Retreats to convey the principles of sustainability to the younger generation. 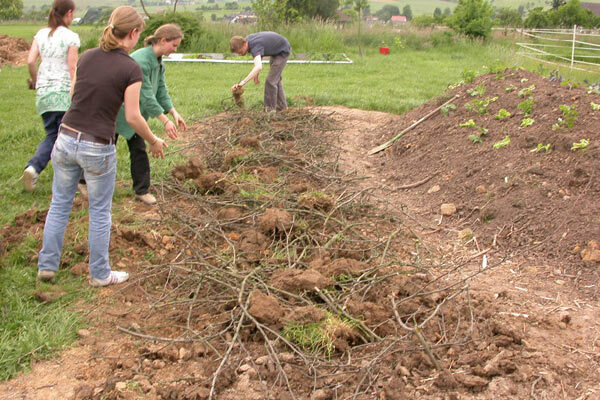 These retreats are sponsored by the European Union’s “Youth in Action” program. 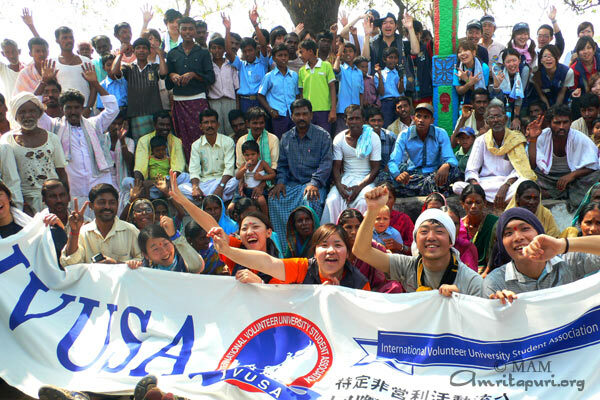 The UN Decade on Education of Sustainable Development is an international education initiative. 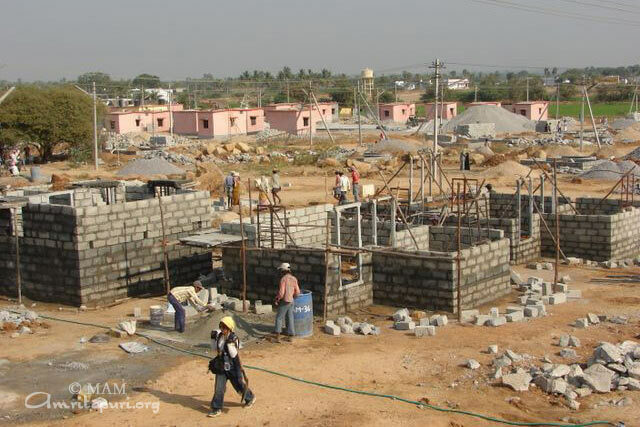 The states of the United Nations have committed themselves to learn in the years 2005 to 2014 the concept of “sustainability”. 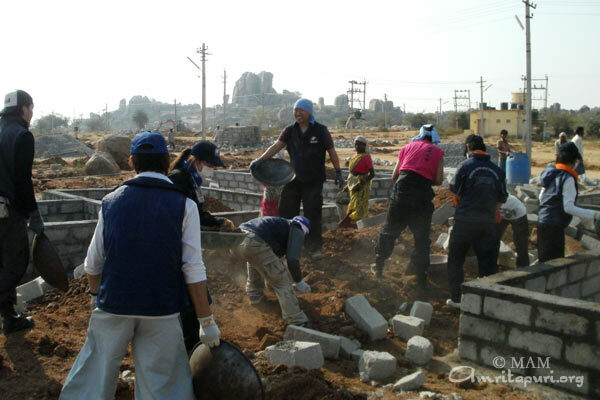 The German Commission of the UNESCO coordinates the activities of the UN Decade in Germany together with the Federal Ministry of Education. 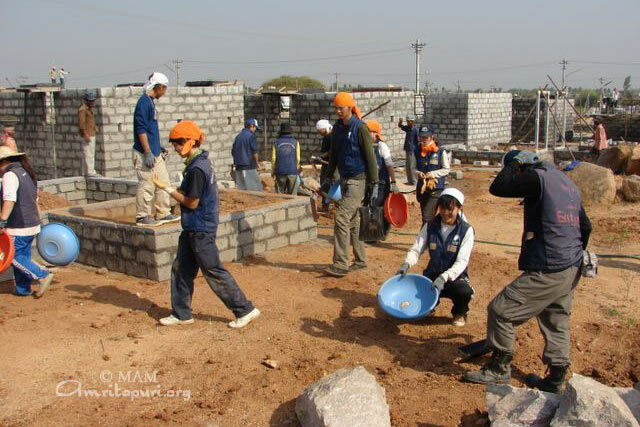 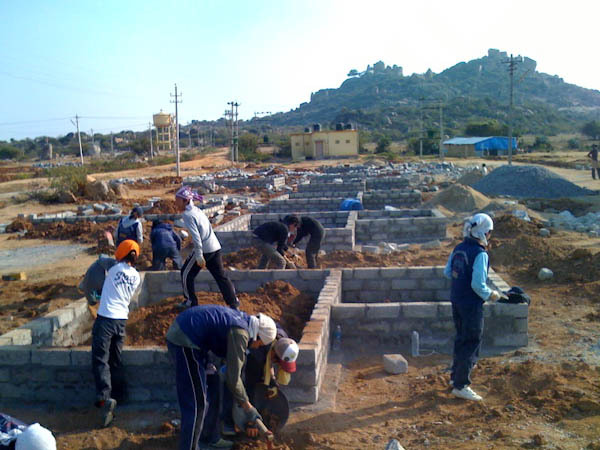 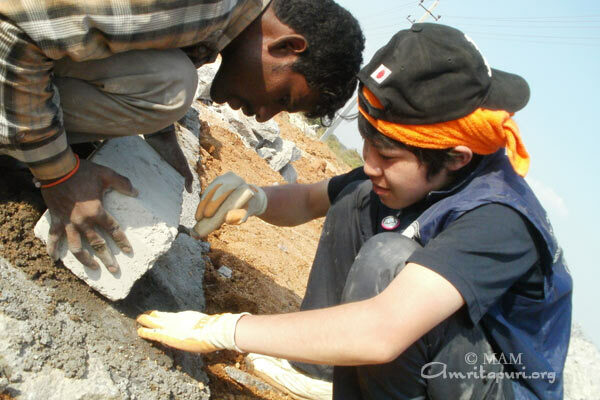 Sixty students from Japan’s IVUSA (International Volunteer University Student Association) came from Tokyo to join Amma’s house construction project at Raichur in Karnataka. 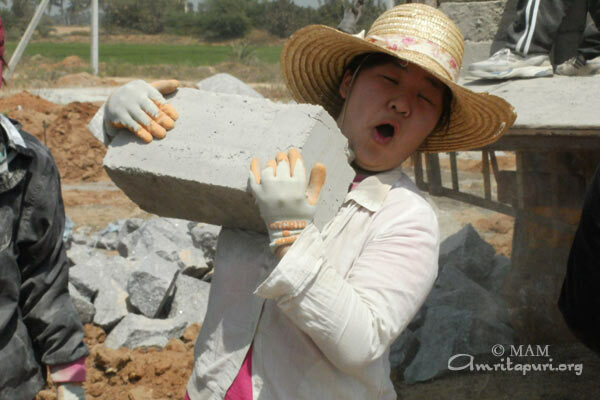 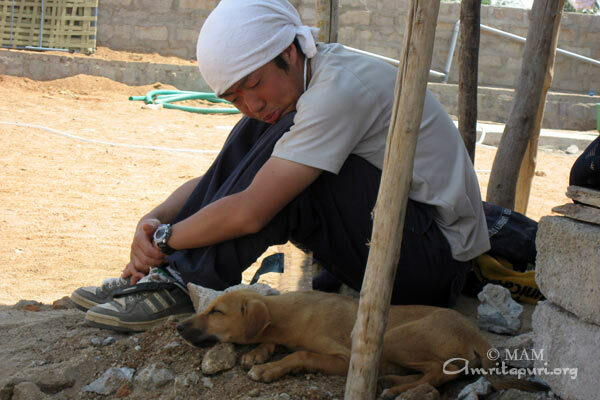 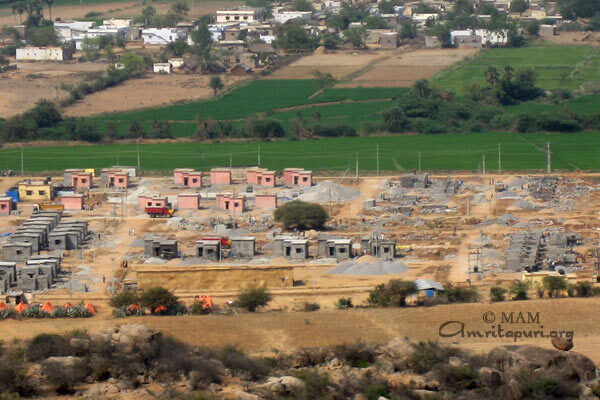 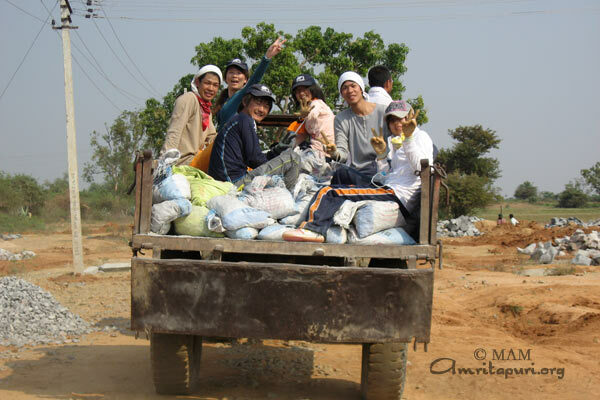 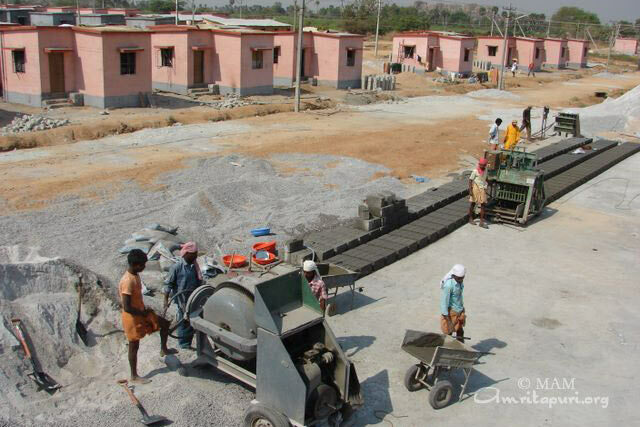 They stayed for more than a week and started spending their days in hot sun helping the construction of the houses. 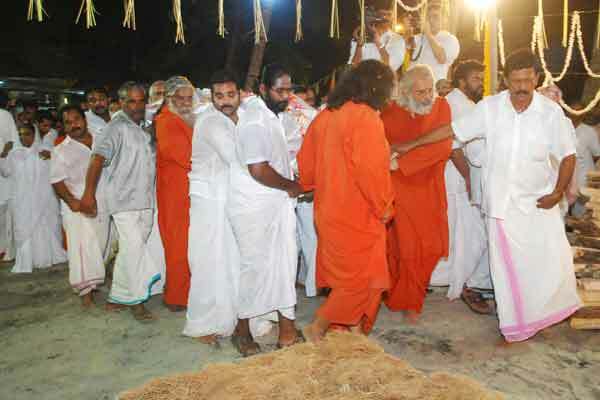 Temperature touched above 42 degrees and many of the students and accompanying bramhacharis fell sick. 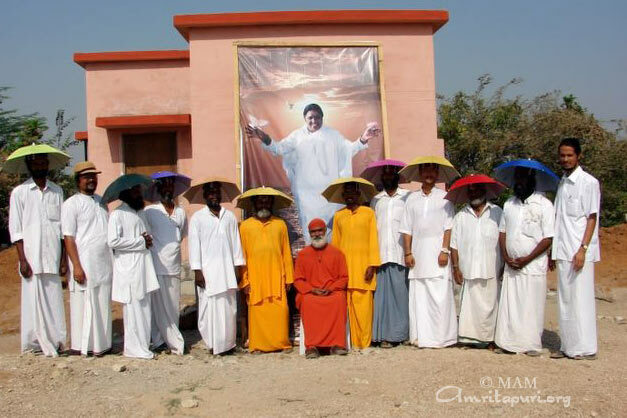 Amma had sent them umbrella-hats to ward off effects of excessive heat. 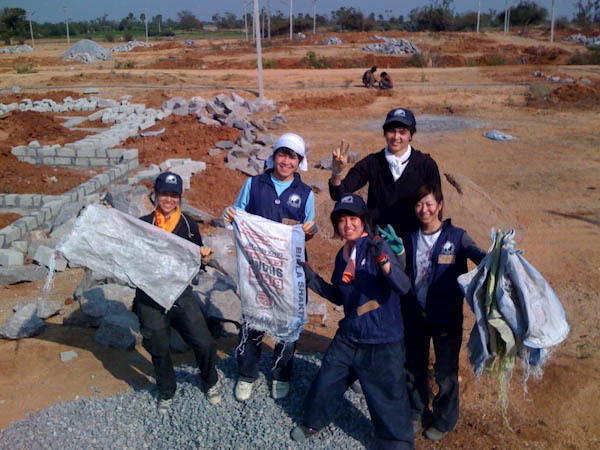 Most of the students enjoied working at the construction site during this short visit. 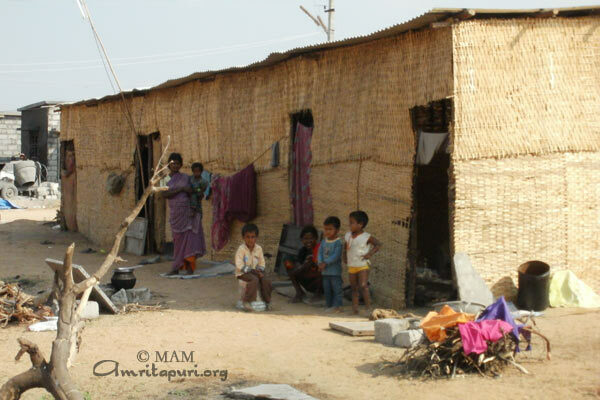 They even spent time with the local villagers and children, celebrating the Holi festival at the nearby village. 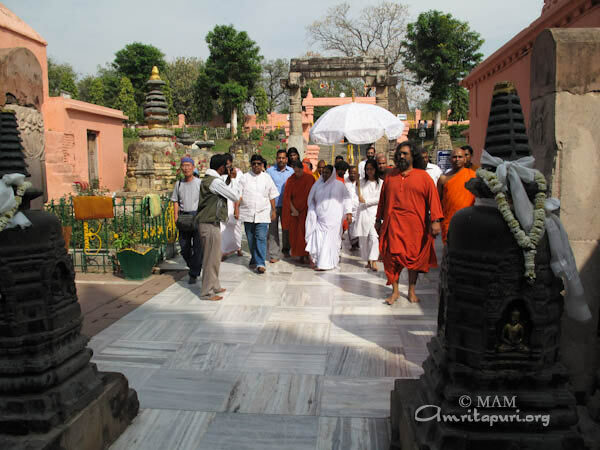 During their free-time, they trekked to visit a Shiva temple atop a closeby hill. 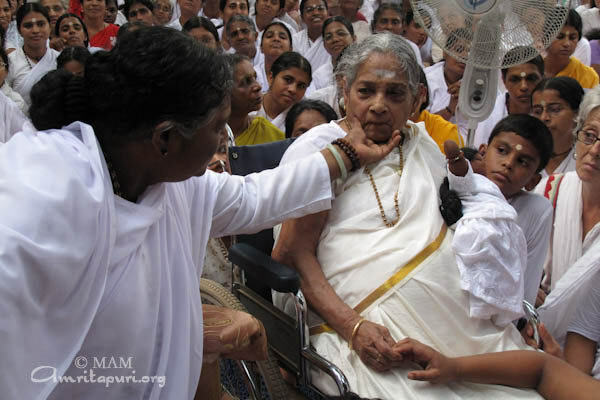 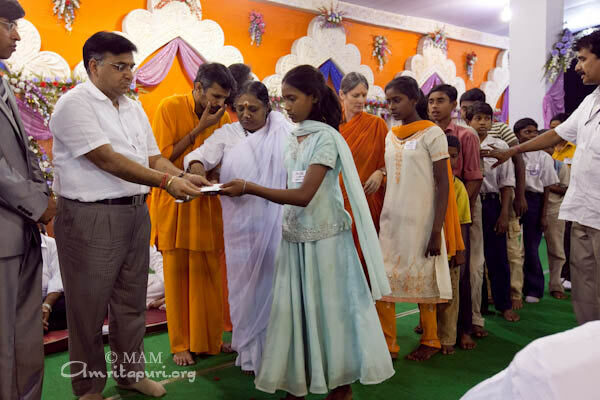 As they arrived in Mumbai and later in Delhi after their assignment, all of them met Amma before returning back to their country. 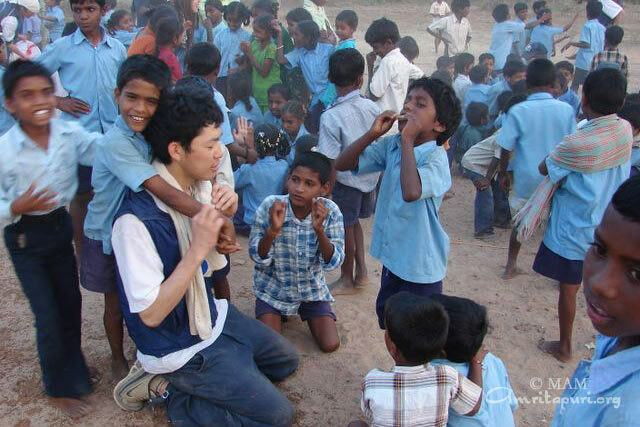 When asked what they had to say about their visit, Yukie said “Incredible India!”. 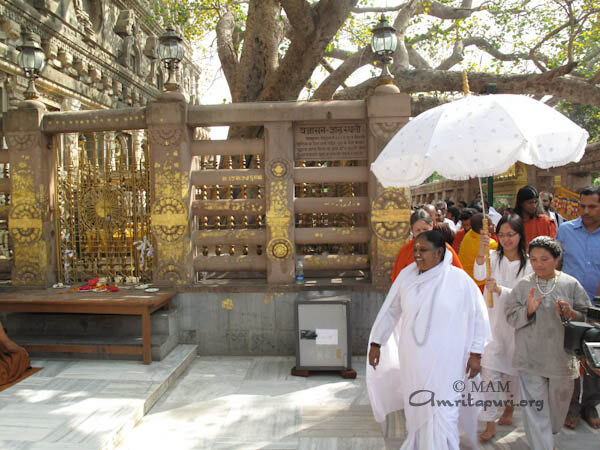 On her way from Delhi to Durgapur, Amma and the travelling group stopped for an overnight rest at Bodh Gaya, the holy place where Buddha attained enlightenment. 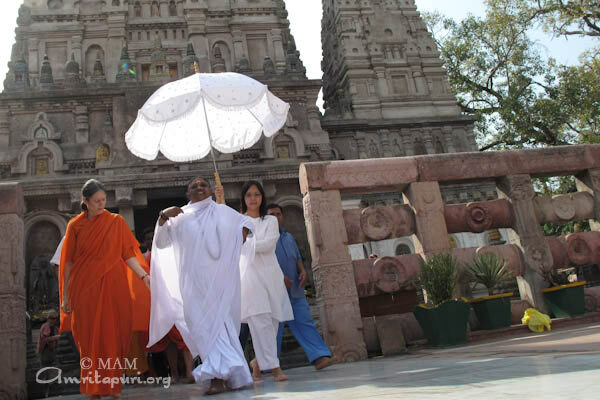 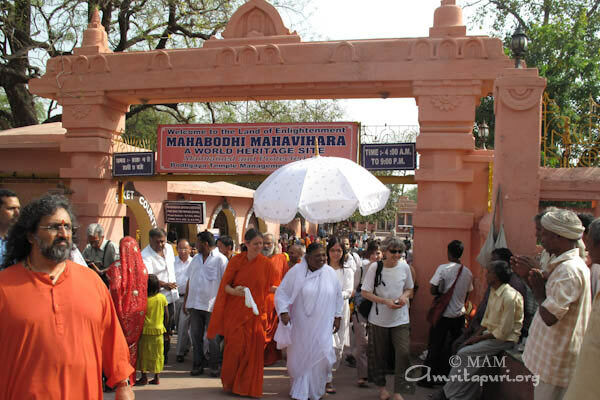 Amma stayed at the Mahabodhi Society of India monastery. 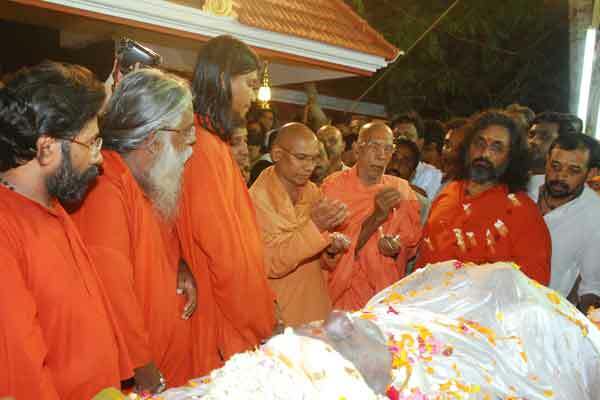 She was hosted by the monks of the monastery to whom she gave darshan and satsang to their greatest delight. 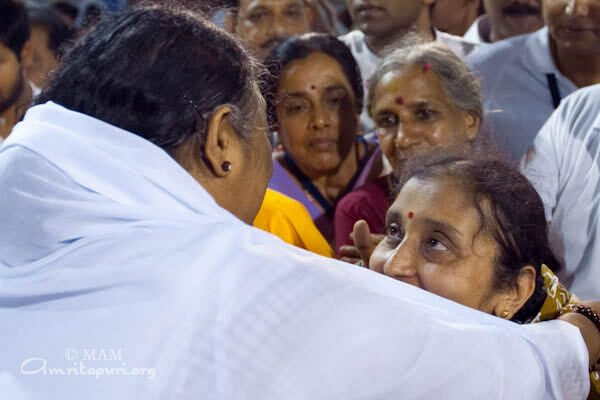 Answering their questions Amma advised them to be steadfast in their practice, stressing on the necessity to maintain faith and a strong conviction when facing challenging circumstances. 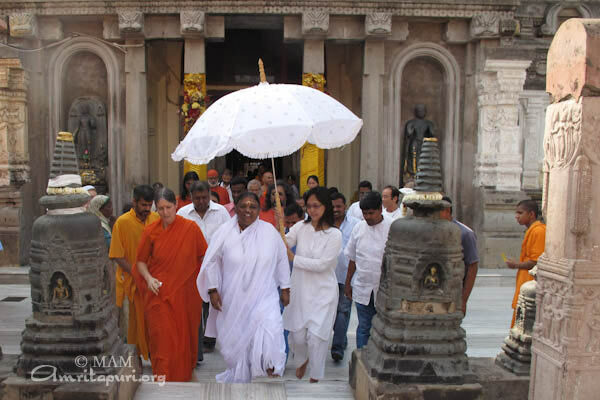 Bhanteji Veri P Seewalee Thera, the Secretary of the Mahabodhi Society invited Amma to visit the Bodhi Tree in the premises of Mahabodhi Mahavihara temple. 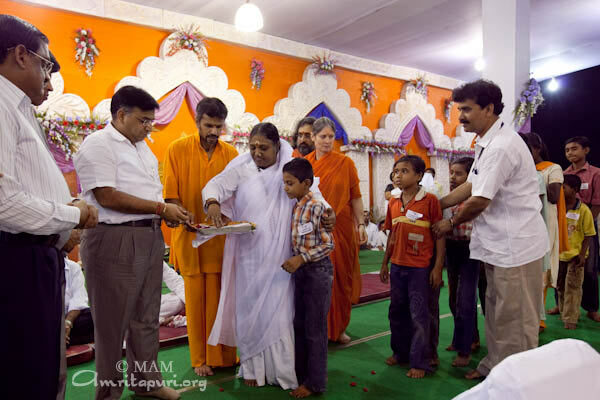 Accepting their prayer, Amma paid a visit to the place before proceeding to Durgapur. 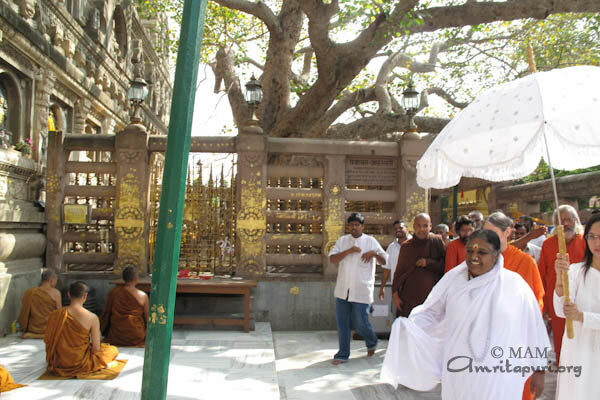 The Bodhi Tree is the peepal tree under which Lord Buddha attained enlightenment 2500 years ago. 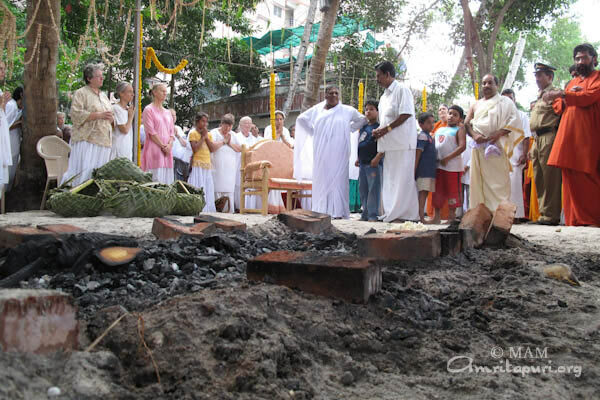 The present tree is grafted from the original one that is no more.